Fall is almost here and it’s one of my favorite times of year. With our (ongoing) home renovation we did a lot of adventuring this Summer, so I wanted to organize our Fall family activities a bit to make sure we also had more down time at home. This Fall bucket list for families is a list of the 10 most important Fall family activities I want to make sure we get to. Surely there are tons more (feel free to drop them in the comments below), but again, I was aiming for slower weekends without as much scheduling. My kids love rides and junk food so naturally we hit up a good amount of fairs on Fall weekends. This is a tradition my family did growing up and I always loved it so it’s something my husband and I do with our children each Fall. Living in Connecticut we are lucky we don’t have to travel outside our town to see some great leaves and take beautiful hikes with the kids. Two Summers ago we put in a firepit on our patio that my husband and kids refer to as the S’mores pit. We invite neighbors over for S’mores quite a few nights during the Fall. Have you done a corn maze? I got LOST in one a few years ago. When I say lost I spent an hour carrying a 2 year old back and forth down the rows while pregnant. Corn mazes are fun – most of the time ;). I prefer apple pie to pumpkin pie, how about you? We have so many great apple recipes and apples last quite a while after you pick them so we always stock up at a local orchard. If you don’t have your own trees, offer to help an elderly neighbor. My kids have already committed me to being “Luna Girl” from the P.J. Masks show. I decorate the front porch with pumpkins, mums, and corn stalks. My kids decorate the yard with pretend grave stones and skeletons. They (unlike me) get more excited for Halloween decorations than Christmas decor. There’s something magical about being at the beach off season. I’m not a huge fan of jumping in a swimsuit, so wearing a flannel and boots on the sand is right up my alley. An empty beach is an amazing place to take a walk with kids – mine think each and every shell is either from another planet or some kind of precious gem that needs to be taken home and treasured. Mac (my older son): Patagonia Retro X Boys’ Fleece Jacket (Small – he wears size 7 in pants for reference) currently sold out (watch for a restock and find a VERY similar Patagonia Boy’s Fleece Jacket here). The New England weather in Fall is really beautiful so you’ll notice a lot of my Fall bucket list for families ideas are outdoor activities. I’m not sure about you – but while I love Summer, I happily put away my shorts for the year come September. Give me all the leggings and jeans. 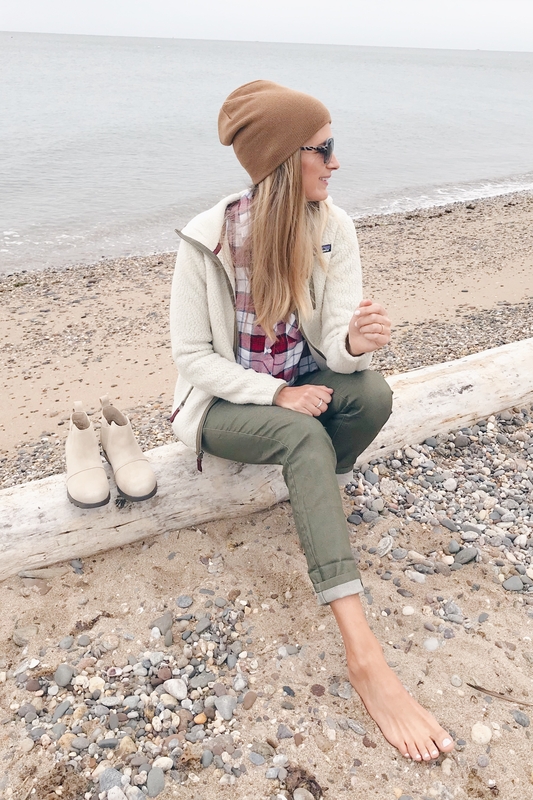 I wanted to share some of my favorite Fall layers for the family from Backcountry in case you might be planning some outdoor adventures as well. Backcountry carries all my favorite outdoor clothing brands like Sorel, Patagonia, and The North Face. I still have a Patagonia jacket I got in high school that I’m waiting for my son to grow into! The quality of these pieces is really great so they will last you for years to come. I stuck with neutrals (except for Cam’s jacket because he LOVES orange) so that these jackets would coordinate with just about all our other outfit pieces. You’ll see my brother stepped in and wore my hubby’s jacket while we were at the beach this weekend because Chris forgot to bring any long pants down to the beach cottage. While my husband likes to make a fashion statement wearing socks with sandals, I thought his workout shorts with boots and a fleece jacket didn’t give the cozy Fall feels I was going for. It was 50 degrees at the beach this weekend which felt VERY cold after last weekend’s heat wave. The Patagonia Classic Retro X men’s fleece runs big in my opinion. Consider sizing down one size. Everything else you’ll see below fits true to size. I’d love to hear from you guys what’s on your Fall bucket list. If you’re planning any outdoor adventures make sure to checkout Backcountry for not only the best quality outdoor apparel but also the gear to get you there (tents, coolers, yoga items, etc). They have 24/7 customer service and free 2-day shipping over $50! You can use code RACHELM15 to get 15% OFF your first order at Backcountry.com. Some exclusions apply, one use per customer. Great post! This is a great fall bucket list! Going to the beach in the fall time is actually the perfect. The weather at some beaches will still be very hot, kids are in school so no crowds, and prices for hotels and stuff drop because it’s off season. I would like to visit one in fact this season!